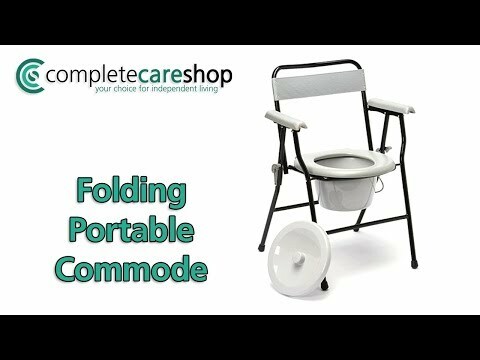 The Folding Portable Commode is a lightweight and manoeuvrable commode that is designed to fold for excellent portability. Its surprisingly lightweight frame is very strong and supportive for the user whilst still retaining features that makes it easy to transport or store away when not required. The Folding Portable Commode also features armrests and a moulded backrest to provide exceptional user comfort. The backrest and toilet seat are made from high-grade plastic, making them lightweight and easy to wipe clean after use. This makes it easy for users and carers to maintain good personal hygiene when using the Folding Portable Commode. In addition, this commode's backrest functions as an easy-carry handle when it is folded making it even easier to move the Folding Portable Commode from one location to another. The plastic commode pan is supplied complete with a lid and metal handle to make the removal of waste a simple and hygienic process. Had been considering this as sometimes difficult to get out of bed to get to the bathroom in time, especially in the morning. The portable folding commode has been a great help on those occasions and great for those night time bathroom breaks. Easy and very comfortable I was surprised! I would recommend this product to anyone who has mobility issues. Got this for my wife to use on our narrow boat. Not been on it for a couple of years due to her poor health and deteriorating mobility. It fitted the spaces available and helped considerably.